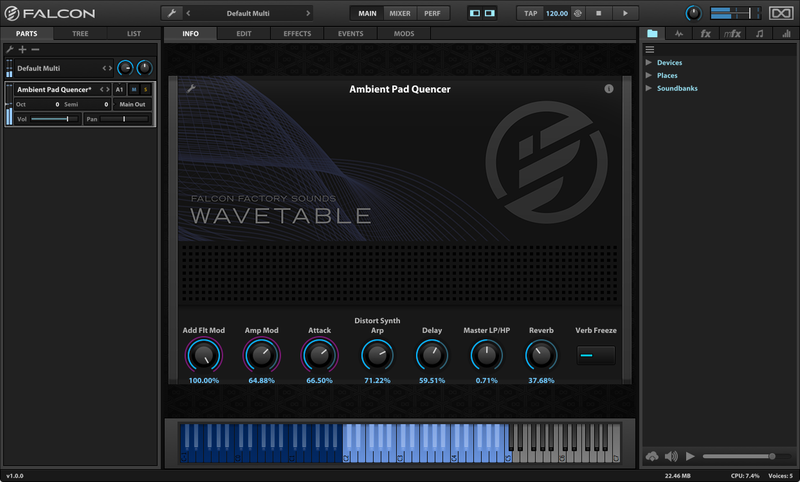 In addition to an expansive factory preset library each purchase of Falcon includes a $100 / 100€ voucher good towards the purchase of any soundbank or Falcon Expansion on uvi.net. With dozens of choices ranging from orchestral instruments to vintage synths, you can immediately expand Falcon to complement your style. Falcon comes with an incredible collection of presets created by some of the world's most recognized sound designers, but there's much more to discover. Falcon is fully-compatible with all UVI and UVI-Powered instruments from a growing list of companies like Acousticsamples, VI Labs and Virharmonic. As an integral part of our vision, UVI is committed to keeping the Falcon experience fresh and innovative through regular updates including new factory content, modules, enhanced functionality and optimizations. 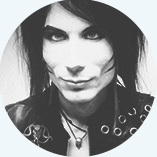 Registered users can access the newest version anytime from the My Products page. 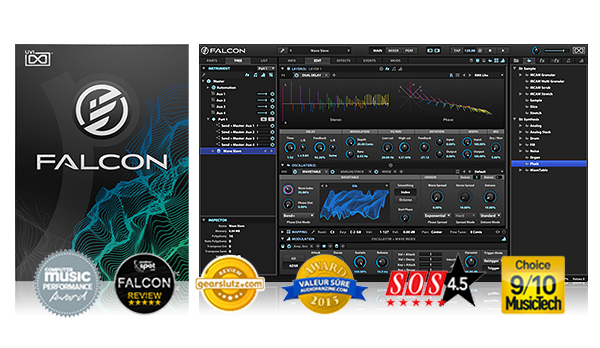 Falcon includes 15 oscillators covering a wide range of modern synthesis methods from basic sample playback to more advanced generators like Pluck, Wavetable and IRCAM Multi Granular. 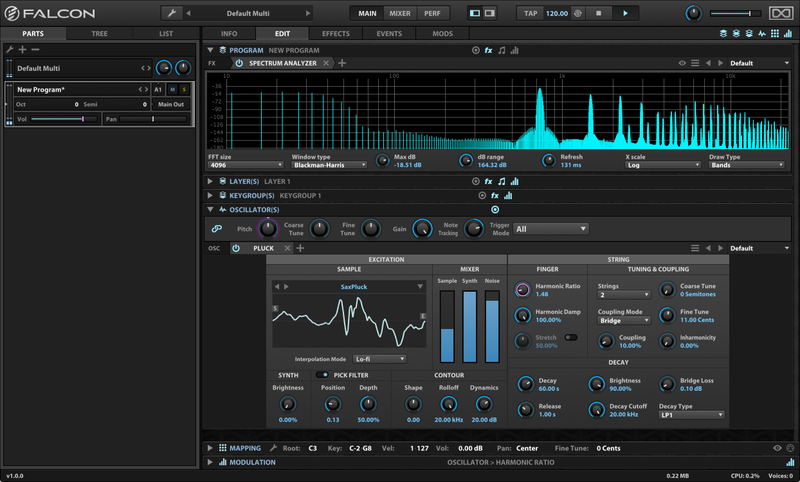 One of Falcon's greatest strengths is its ability to freely layer oscillators to create elaborate hybrid instruments that capitalize on the unique features of both sample-based and algorithmic sound creation. There are no preset limits on the quantity or type of oscillators you can use, you're limited only by your computers processing power and imagination. A virtual analog oscillator outfitted with a traditional selection of waveforms including Sine, Saw, Square, Triangle, Noise and Pulse. Includes pulse width modulation, sync control and a robust unison section supporting phase, tuning and spread control on up to 8 voices. Designed for the creation of rhythmic and percussive sounds, DRUM utilizes both a pitched oscillator and noise generator. Both pitched and noise oscillators sport discrete AD amplitude envelopes with the former providing pitch modulation. 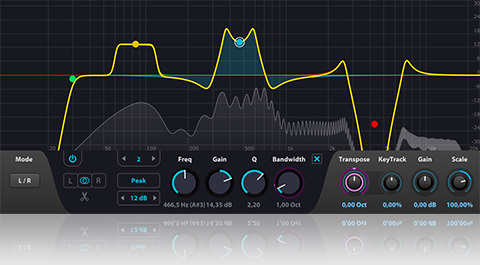 EQ and distortion are available in the master section for broad shape control. An 8-voice implementation of the Analog oscillator designed to facilitate the rapid layering. Each voice utilizes the same basic engine found in the Analog oscillator, substituting the Unison and Sync sections for Pan and Gain to facilitate spatial and level mixing and a pitch section for subtle to extreme voice detuning. A four operator FM oscillator which can be used in either ratio or Hz modes and is arrangeable in one of 11 configurations. Additional operator controls include Fine Ratio/Freq Multiplier, Snap Ratio (which quantizes modulation frequencies to harmonics) and Start Phase. A robust noise oscillator offers 15 unique noise shapes including Band, S&H, Static I, Static II, Violet, Blue, White, Pink, Brown, Lorenz, Rossler, Crackle, Logistic, Dust and Velvet. Dynamic shapes provide additional control such as Static Density and Logistic Chaos. A drawbar-style organ oscillator with 8 bars representing different harmonics traditionally used on pipe organs. ORGAN provides discrete Gain and Pan controls for each partial and a percussion section with Fast/Slow and Harmonic controls. Pair with the rotary effect for a classic organ sound. A physically inspired string synthesis module, Pluck utilizes both algorithmic and sample-based excitations to create rich harmonic sounds with natural decay. Choose from a selection of factory impulses or load your own samples, modulate sample start time and tune, adjust the initial excitation, coupling of multiple strings, and finally contribution of sample, synth and noise generators. A fully-featured wavetable oscillator provides multiple phase distortion modes and a robust unison section with wave and stereo spread across up to 8 voices and FM support. Modulate the Wave Index to sweep through wavetables which can be chosen from a large selection of factory content. 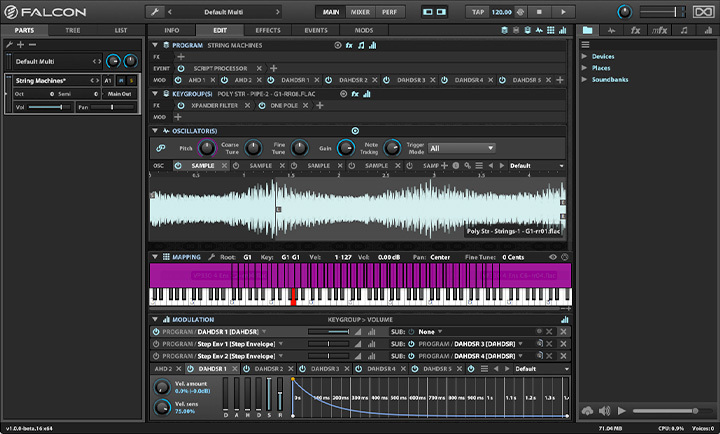 Wavetable can also import a variety of user files including WAV files (single or sequential), user tables or graphic image files which are converted pixel-rows to cycles, brightness to amplitude. At the heart of Falcon’s sample oscillators is a full-fledged sample editor allowing you to quickly make changes to your samples without moving to an external application. Crop, normalize, silence, reverse, add fades, or even bounce Falcon’s effects to your sample in place. Additionally, you can select multiple files and batch them all at once. A no-frills workhorse sample oscillator, ideal for basic soundboards and traditional sample playback. The Sample display can be interactively resized and provides editing functions such as crop, normalize, silence, reverse and fade in/out along with the ability to apply any of Falcon's effects in-place. Due to Falcon’s ability to efficiently stream samples from disk you can manage tens of thousands of samples at once without a massive RAM footprint. Ideal for rhythmic and percussive material, the Slice oscillator can divide samples into discrete keygroups to be resequenced. Adjust transient sensitivity manually or use embedded markers like those found in REX files. Drag-and-drop export of sliced file maps in a variety of ways including as a Falcon patch, discrete WAV files, or MIDI sequence. A realtime, low-CPU pitch-shifting sample oscillator. Stretch can adjust pitch up to ±2 octaves while maintaining sample duration. Freely adjust sample start time, playback mode and tempo analysis. Use the Solo Mode button to switch between discrete monophonic and polyphonic pitch-shifting algorithms. IRCAM's premier granular oscillator, divides an audio sample into grains and recombines them for realistic pitch shifting or soundscape generation. Adjust Grain parameters such as Size, Density, Jitter, Position, Speed, Direction, Loop Mode, Pitch Variation and Correction Method. A multi-voice implementation of the IRCAM Granular oscillator which can be used to great effect to achieve a range of complex unison sounds. Includes the same control set from IRCAM Granular with an additional section to control voice quantity, position and spread. Similar to the Stretch oscillator, but implementing IRCAM's high-quality phase vocoder for time-stretching and pitch-shifting with transient and envelope preservation. Requires more processing power than the standard pitch-shifting algorithms used in other oscillators but with a significant quality improvement. 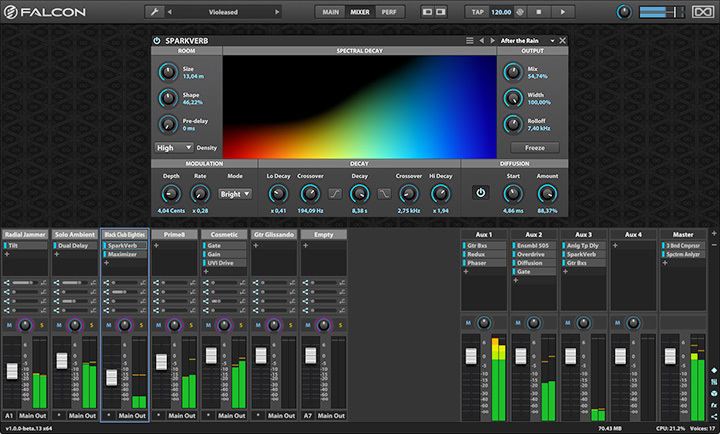 Similar in use to IRCAM Granular, IRCAM Scrub offers random-access scrubbing, speed and directional control but uses the same top-quality algorithm found in IRCAM Stretch. Falcon includes over 80 high-quality effects, categorized for easy navigation: Delays, Reverbs, Modulation, Filters, Equalizers, Amps and Stereo, Drive and Distortions, Dynamics, Analysis and more. With effects suited for nearly every need from creative mangling to precise sound sculpting, mixing and analysis, Falcon provides a tremendous sound design facility. Effects within Falcon can be instanced as sends on effect busses, at the program, layer or note level and allow for extensive control of your signal and an unrestricted approach to sound and instrument design. Additionally, effects can be racked in an EffectRack for parallel and multi-band processing, or as a central, reusable multi-effect with macro-driven controls. An all-purpose delay effect inspired by classic analog delays using tape loops. A versatile delay module with with discrete channel controls for creating time-based effects. A sophisticated display visualizes changes to time, stereo and phase. 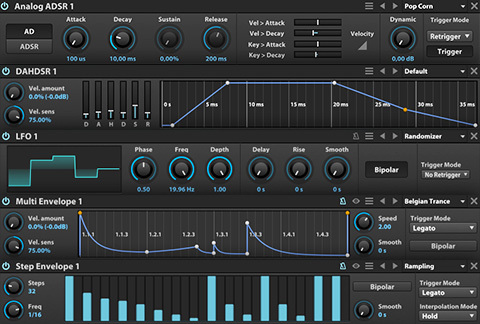 Spreads the signal over time, creating a simple yet versatile decay with reverb-like results. A highly-optimized convolution-based reverb module. Includes a large library of factory impulses with support for user samples. A versatile algorithmic reverb capable of producing an extremely broad range of spaces with a minimal control footprint. Uses the same engine as the stand-alone effect plugin. A traditional chorus unit inspired by a vintage analog effect pedal. A traditional flanger unit inspired by a vintage analog effect pedal. An ensemble chorus effect inspired by the ensemble effect section of a popular vintage synthesizer. A classic flanger effect, mixing the input signal against a variable time-delayed version of itself. Shifts all frequencies in the spectrum by a set amount (Hz) for interesting morphing effects, widening, sound thickening and repitching inharmonic sounds like drums. A variable 12-order automatic phaser with LFO-based sweep between adjustable high and low frequencies. Visualizer displays filter shape at low and high frequency positions. A vintage speaker emulation with highly-customizable cabinet and mic controls. A variable 8-voice chorus effect specifically designed to reduce artifacts for enhanced depth and clarity. A unique filter inspired by the filter section on a popular American analog synthesizer. The classic swiss-army knife multimode filter. A steep butterworth Lowpass or highpass filter with slope ranging from 24 to 96 dB/oct. A classic comb filter module. A time-delayed version of the input signal is fed back into self and added or subtracted. A crossover filter with selectable low-pass, band-pass and high-pass modes and variable crossover frequency. Configure in EffectRack chains for multi-band processing. A multi-mode filter with variable slope ranging from 6 to 96 dB/oct, spread and keytracking. A classic 24 dB/octave ladder lowpass filter with resonance (order 4). A classic 12dB/octave lowpass filter with resonance (order 2). A gentle and very efficient 6dB/octave lowpass or highpass filter. The most efficient of all filters by far. A variable 12-order manual phaser with sweepable frequency and filter shape visualizer. A unique filter inspired the filter section on a popular Japanese analog synthesizer. A MultiMode (LP, HP, BP, Peak, Notch) State Variable filter with optional built-in saturation. A filter that is continuously adjustable between low-pass and high-pass modes. A dual-filter version of the classic talkbox effect. A classic wah filter effect with manual control over the wah amount. A multimode (37) variant on a 4th order ladder filter with built-in saturation and oversampling. A 3-band EQ divided as Low, Mid and High. The Mid band is a bell curve, while the Low and High bands are shelves. An emulation of the tone circuit in a popular fuzzbox guitar pedal. A convolution processor specifically designed for emulating EQs and cabinets. Choose from a large selection of factory impulses. Supports user samples. A parametric EQ with up to 16 bands, variable filter shapes, L/R and M/S modes, interactive graphic display, transpose and keytracking. A 2-shelf equalizer, inversely applying a low-shelf and a high-shelf. Emulates the tone control section found on many popular amplifier heads. A classic autopanner, varies the stereo pan with an LFO. A typical level-adjustment module, boost or cut the input signal level. Sets the gain level and phase of each channel allowing for simple per-channel adjustments and specialized gain/phase transformations such as decoding M/S to stereo. A classic tremolo effect, varies amplitude with an LFO. A specialized stereo width enhancer. 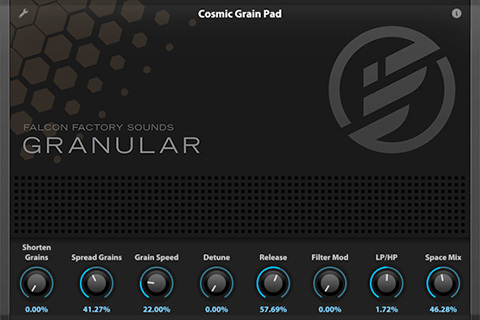 A classic crunch effect inspired by popular electric guitar effect pedals. A complex circuit-modeled clipper with Tone and High Pass filtering controls. A distortion effect with 3 different saturation modes and internal oversampling up to 16x. A level-tracking saturation effect with selectable tape or tube distortion. A classic fuzz effect inspired by guitar and bass effect pedals. A specialized convolution effect designed to emulate signal reamping. Emulates various amplifiers and the characteristics of subsequent capture microphones including dynamic, condenser and ribbon mics. 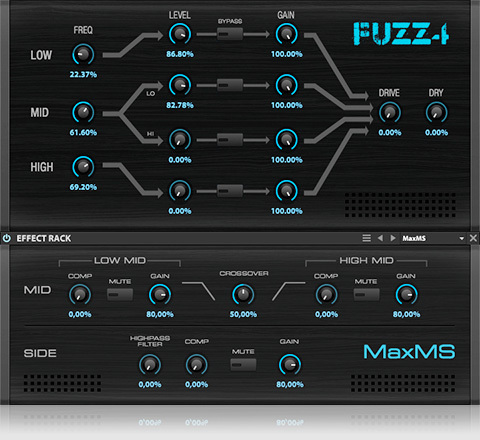 A distortion effect with many saturation modes, input and output filters and internal oversampling up to 16x. A multi-band variant of the Compressor module with adjustable crossover frequencies. A multi-band variant of the Studio Limiter module with adjustable crossover frequencies. A 2-stage dynamics processor, a compressor stage tames signal peaks over a variable threshold then an expander gates the signal below a second variable threshold. A traditional gate effect, silencing signal below a variable threshold. A look-ahead limiter with graphical timeline visualizer that displays dynamic range of the input and output signal. A precision limiter ideally suited for individual parts or stereo mixes. Displays the input signals phase correlation. Mono signal is represented by a vertical bar. Out of phase stereo signal is represented by a horizontal bar. Displays the frequency content of the input signal. Frequency is mapped across the X-axis, amplitude along the Y-axis. A chromatic tuner with needle-style meter, accurate to 1 cent increments. A helpful tool when adjust a sample's pitch with its keygroup Fine Tune parameter. Creates a discrete, inline effect path controllable by a a customizable macro-driven interface and supports multiple chains. A resampling effect useful for emulating the lo-fidelity sound of various hardware units or extreme bit reductions. A typical vinyl simulation effect outfitted with year, speed, wear, electrical and mechanical noise, dust and scratch simulations. A stereo delay module with auto-panned stereo modulation. A delay effect utilizing multiple delay lines and diffusion to produce a dense delay tail. A typical delay unit with additional stereo processing. A general purpose delay module with delay time, feedback, cutoff and mix parameters. A delay module with discrete delay paths for the left and right channels. A simple 2-band EQ with Low and High bands. A simple 3-band EQ with Low, Mid and High bands. The Mid-band is adjustable while the Low and High bands have fixed frequency assignments. An 8-band parametric EQ with variable filter shapes and an interactive graphical display. A typical wah pedal effect, with its filter frequency set automatically by the module's input level. A two-stage filter effect, low-pass and high-pass applied in series. 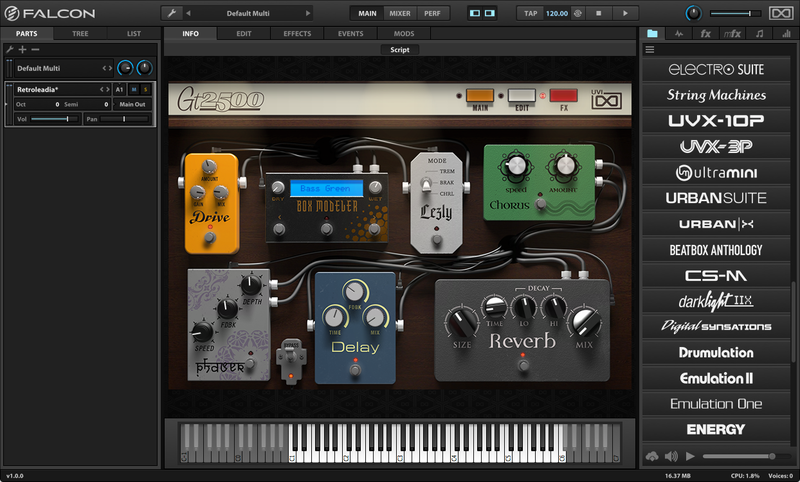 Simulates the vowel shaping filtering found on classic talkbox effect pedals. 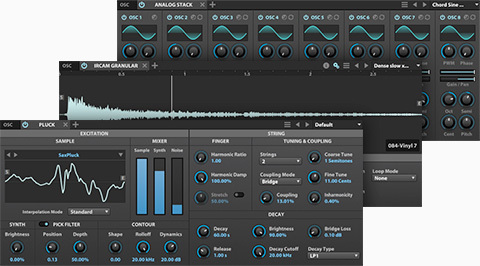 A standard dynamics compression module with Ratio, Threshold, Attack, Release, Makeup Gain and Mix parameters. A standard limiter module, compressing the input signal with higher ratios than those of the Compressor effect. A precision mastering processor ideal for stereo mixes, such as Falcon's main outs. 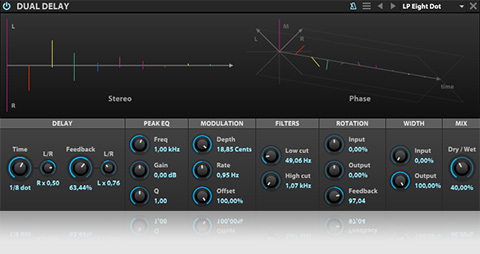 Provides a multi-band compression, limiter and tube saturation stage. A reverb with a variable onset gate stage to abruptly cut the reverb tail. A CPU-optimized general purpose reverb. A standard reverb effect fed through a delay line. A standard reverb effect fed by an optional low-pass or high-pass filter. A classic chorus effect, mixing the input signal with multiple time- and pitch-modulated variations for a shimmering unison effect. 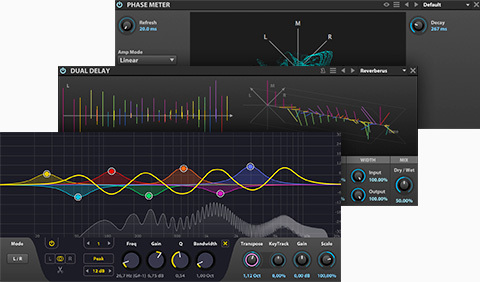 A phaser with an integrated auto-panner, produces a wider and more varied phasing effect. A classic phaser effect, mixing the input signal with a phase-modulated version of itself. A multi-stage effect made up of a filter sandwiched by two drive stages. A typical drive module with post-drive-stage UVI Filter. A single-speaker emulation of a rotary speaker. A dual-speaker emulation of a rotary speaker with adjustable crossover. Slices the incoming audio on a variable grid. When activated will repeat the most recent slice. Useful for glitch effects and variations in a live performance or looped samples. Combines the input signal with a modulation frequency and both subtracts and adds the modulation frequency to the input frequency. A ring modulator with additional modulation section. A resampler and bit reducer with optional overdrive and filter stages. Falcon includes 8 modulation generators including AHD, Analog ADSR, Attack Decay, DAHDSR, Drunk, LFO, Multi Envelope and Step Envelope. Modulation generators can be instanced at any level in a patch allowing them to control nearly any parameter, be it on an oscillator, effect or even on another modulator. This system allows you to paint motion into your sounds almost effortlessly, from subtle variation over time to complex on-demand sequences. Every modulation generator in Falcon can store presets, providing a quick way to save and reuse configurations that you find useful. Falcon ships with over a thousand preset wave shapes for the Multi Envelope generator alone. [Attack, Hold, Decay] envelope, a simpler variant of the DAHDSR envelope found on some classic synthesizers. [Attack, Decay, Sustain, Release] envelope, emulates the decay characteristics of vintage hardware synthesizers and provides handy remapping tools to modulate attack with incoming note velocity or decay with note pitch. [Attack, Decay] envelope, the most basic envelope in Falcon, useful for percussion and other sounds that don't require a sustain or release phase. [Delay, Attack, Hold, Delay, Sustain, Release] envelope, an extension of the more common ADSR envelope, adds an additional Delay phase at the beginning and a Hold phase between Attack and Decay. Generates a random walk signal which simulates the natural randomness of pitch and amplitude drift found in sustained notes. [Low Frequency Oscillator] generates a cyclical modulation in one of the following waveshapes: sine, square, triangle, ramp up, ramp down, analog square, random s&h, chaos lorenz, chaos rossier. You can also draw your own custom wave shapes for precise control. A user-definable envelope that can be created with any number of points and interactive curve shapes by manually drawing or drag’n-dropping MIDI or audio files. Allows for long and highly-expressive modulation sequences and can be looped for LFO-like behavior. A programmable pattern sequencer, can be tempo-synced to steps of musical division or set to discrete time values. 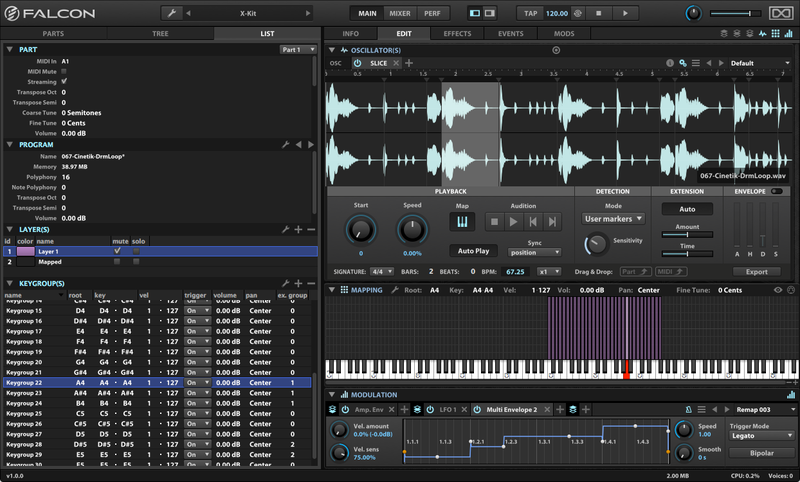 Falcon's Event section provides control over pre-synthesis data, namely the manipulation, analysis or generation of MIDI. Event processors can do anything from arpeggiating incoming notes or strumming them like a guitar to applying micro tunings, playing back MIDI files or creating generative sequences. 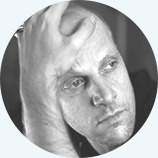 Script Processors are custom Events which allow Falcon's functionality to be extended with the Lua language. Factory Script Processors include the Chorder, Harmonizer, Unison, Ensemble and many more. Load any Script Processor and click the 'Edit Script' button to take a look at how they work. 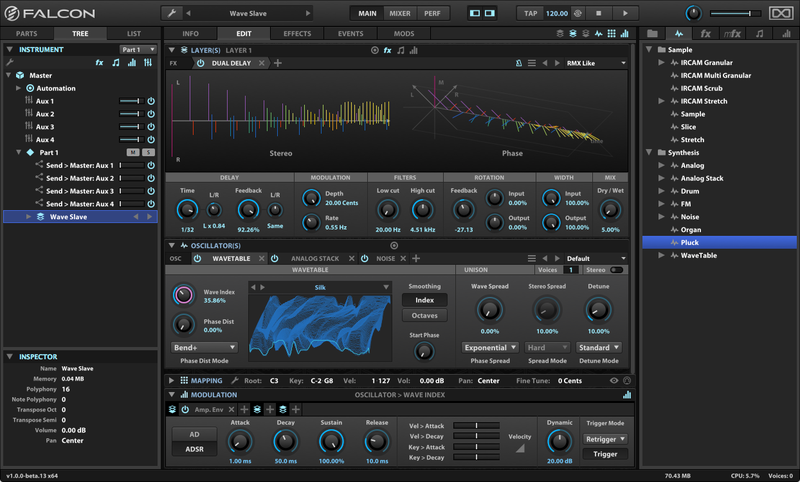 Experiment with modifying them or write your own, Script Processors provide both an extremely powerful way to interact with existing instruments and a sophisticated code-driven approach to sound design. An advanced variation of the classic synthesizer effect, modifies incoming notes and plays them back in programmable patterns. Includes up to 128 steps of variable pitch, velocity and step length modulation, 26 playback modes, resolution from 1/64 tri to 32x and dozens of preset factory shapes. Plays back a standard MIDI file tempo-synced with the project. Applies an alternate tuning to the standard twelve-tone equal temperament system to all incoming note data. User adjustable pitch per note or load Scala/AnaMark tuning files (.scl, .kbm and .tun). Falcon's generic event shell, Script Processor, contains a number of useful Event Processors and can be extended in near-endless ways with user scripts. Scripts are divided categorically for easy navigation and include Analysis, Effects, Harmonization, Performance, Sequencing and Utility sections. Effortless create chords with the Tonal Harmonizer, trigger sophisticated note sequences with Step Line or script your own processors to extend Falcon's functionality any way you need it. Falcon's UI is presented in a single, flexible and scalable window that can comfortably operate on both small portable screens and massive desktop displays. A full-screen view is also available that optimizes editing of complex waveforms and detailed envelopes. Editing is primarily done through the MAIN viewport, which is divided into 3 columns that facilitate navigation, editing and file/preset browsing. The central columns EDIT tab provides a comprehensive visual representation of your entire instrument split into varying levels of detail from the Program (instrument) level all the way down to the keygroup (note) level. A Layer level resides between the two that lets you easily organize and modify selections of keygroups. Quickly focus your view with global and level-specific filters, collapse sections as needed and easily tab through modules for editing. For a more data-driven approach the TREE and LIST tabs provide a perfect hierarchical view of your project, allowing for surgical editing of individual components or broad stroke editing of large selections. Nearly every parameter in your instrument can be assigned to a macro. Macros live in a dedicated tab and can be freely arranged with an interactive graphical editor. 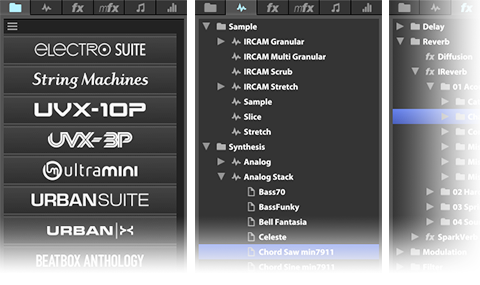 Quickly create custom UIs for your instruments that suit your needs without any scripting knowledge. Macros can target as many parameters within your instrument as you like, allowing for the creation of powerful and unique controls. The browser gives you immediate access to files, soundbanks, oscillators, effects, multi effects, modulators and events through dedicated tabs. Browse traditionally or use the search and favorites tagging command to instantly call up relevant results. Falcon's mixer offers a typical mixing desk view of your project. Monitor and adjust channel gain, pan, mute, solo and effects and configure Aux channels. Quickly focus your view with channel and component-level filters. A dedicated performance editor provides a birds-eye view of all loaded instruments' level, pan, pitch, IO, note response range, velocity range and keyswitch settings. Load your favorite instruments and map them across one or many controllers for a dynamic performance in moments. Falcon ships with an impressive collection of 1,000 factory patches designed by some of the industry's top sound designers. 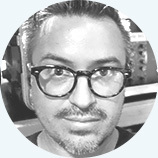 Covering everything from classic synthesis methods, percussion, physical modeling, sample-driven granular and multi granular soundscapes to multi-oscillator hybrids. The 1,000 presets were all created to an extremely high quality standard, delivering an extraordinary and hugely versatile selection of sounds right out of the box. Categorically divided for easy browsing, Falcon's factory sounds provide deep performance and editing control via customized macros. Make broad-stroke changes to get the right feel and then fine tune the sound to fit your mix without ever leaving the macro panel. If a sound is close but still off, you can tab over to the Edit panel at any time for total control. Factory sounds can provide instant gratification or can be used as fuel for your own sound design. 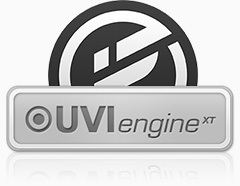 Leveraging the advanced synthesis capabilities and software architecture of the UVI Engine, Falcon Expansions provide an immediate way to extend your library—delivering professional-grade presets fully-programmed with macros to allow immediate and intuitive playability of key parameters. Utilize MIDI, OSC, host automation and Lua scripting for expressive performance or dig in and customize your sounds with Falcon’s abundant effects and modulation options. Take your experience to the next level with these specially made expansion packs! If you need more, Falcon is fully compatible with all UVI and UVI-Powered instruments from a growing list of companies such as Acousticsamples, VI Labs and Virharmonic. From vintage synths, samplers and drum machines to immaculate grand pianos, choirs and orchestras, Falcon is your gateway into some of the world's most sophisticated and best sounding instruments. At Falcon's heart is the UVI Engine XT™, a robust, reliable and CPU-efficient DSP powerhouse that's been constantly refined over the last 10 years. Leaned on by some of the largest names in pro audio, Engine XT provides a host of features that make Falcon one of the most flexible and feature-rich instruments on the market. What's happening under the hood has a significant effect on your experience. Stand-alone, VST, AU, AAX, Windows (8+), Mac (OS X 10.8+), we've got you covered. 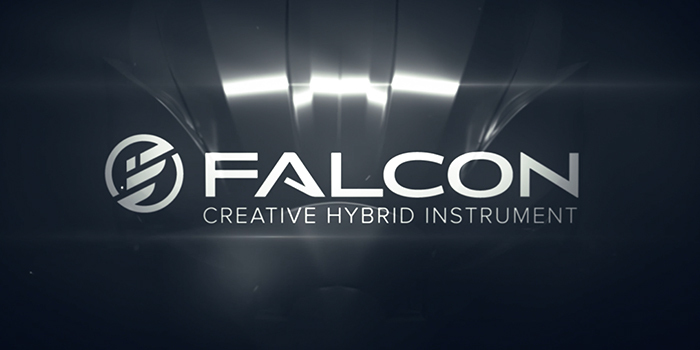 Falcon's core has been optimized for efficient performance on all popular platforms and DAWs. Import audio files of nearly any format, bit depth or sample rate regardless of your project settings. Falcon's on-the-fly resampling provides a seamless 'it just works' sample experience. Rest assured that your projects will continue to stay viable on modern hosts and operating systems well into the future. A core effort with tens of thousands of development hours and a huge user base behind it, you can relax knowing updates will roll out consistently and you'll always have a technical edge.